Heritage Construction and Paving. - Builder, Driveways/Patios/Paths based in Oxted, Surrey. 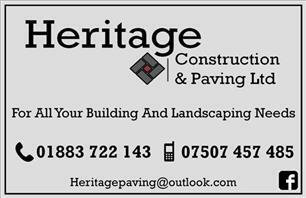 Heritage Construction & Paving ltd are an independent Oxted based company working around the Surrey, Kent & East Sussex boarder with 7 years experience in the industry. We provide a wide variety of building services, no job is too big or small from a patio to a new build . We have close relationships with trusted contractors meaning we can provide a full start to finish package. We are punctual, efficient and friendly always. We take great pride in everything we do ensuring we are professional at all times producing high quality work to the best standard, perfecting all aspects and meeting client specifications. We are always happy to work alongside our clients to meet there desired expectations and budgets. We are competitively priced and all quotes we provide alongside any advice Is free of charge, we are fully insured.